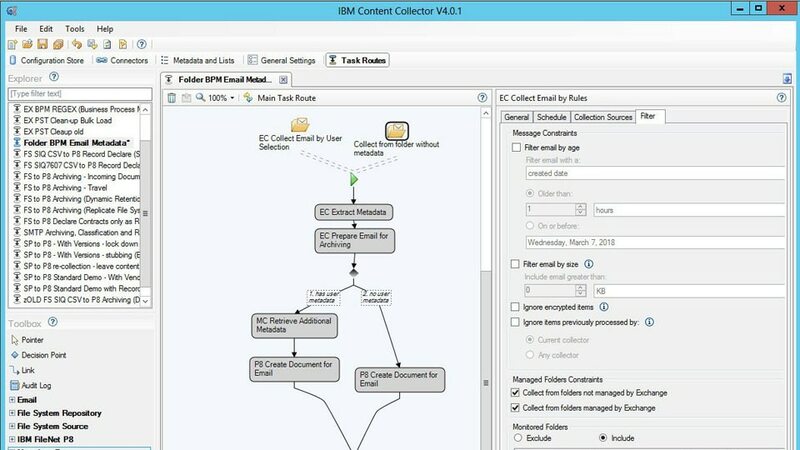 IBM® Content Collector for Email provides automated, policy driven email archiving from mailboxes on IBM Notes Domino®, Microsoft Exchange, Microsoft Exchange Online and SMTP email systems. Policy driven email archiving helps you manage valued information by organization and fulfill legal requirements. Content Collector for File Systems enables users to control documents on network file shares and can be configured to automatically capture documents as they are placed in a monitored location on the file share, or archive existing content based on age, file size, or other criteria. Content Collector for Microsoft SharePoint enables users to capture content from SharePoint for long-term archive, compliance or other business driven reasons. It extends SharePoint with the ability to archive list and library types for better compliance, improved long-term retention and optimized SharePoint performance. Content Collector for SAP applications extends IBM's value-based archiving capabilities across SAP applications and archive stores, including IBM enterprise content management (ECM) repositories and Tivoli® Storage Manager. It enables you to collect, archive and manage SAP generated data and documents in an integrated, security rich repository using your existing or future ECM platform. The primary goal of most Content Collector deployments is to archive content from email servers, shared file systems, and groupware solutions. IBM Content Collector is designed to allow the system operator to define policies on how data that is used less frequently can be archived and removed from source systems. You can learn more by viewing the resource paper provided here that explains the key areas to be considered when planning a Content Collector deployment.